The 22nd James Bond adventure is due for release tomorrow, 31 October 2008, in the UK and a week later in the rest of the world. A key location in the movie is the Residencia, the hotel for astronomers and staff at ESO's Paranal Observatory. Quantum of Solace is the latest film in one of most successful movie franchises — that of renowned 007 Agent James Bond of the British Secret Service MI6. The agent "on Her Majesty's secret service" is once again played by Daniel Craig. 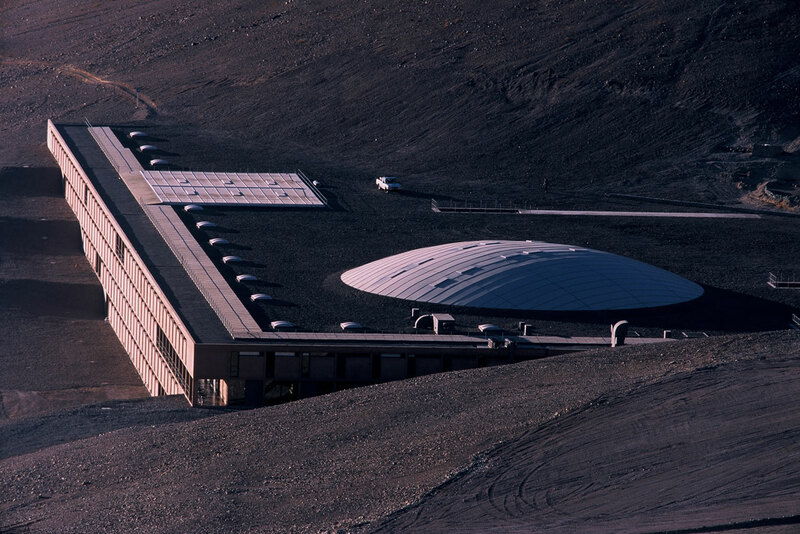 Key scenes of the movie were filmed at Paranal, the home of ESO's Very Large Telescope, and the most advanced optical telescope in the world. 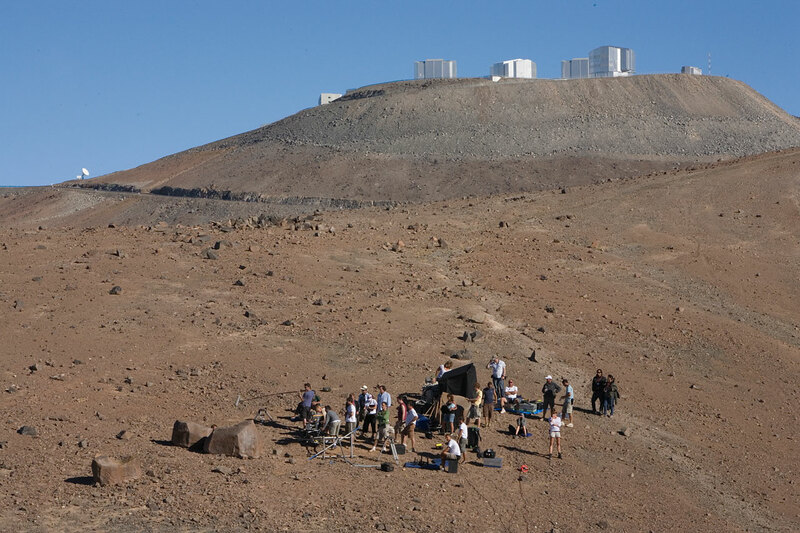 Usually occupied by no more than 100 astronomers, engineers and technicians, Paranal welcomed the 300-strong film crew for several days of shooting at the end of March 2008. The crew travelled from their hotel base in Antofagasta for up to two hours each morning to reach the filming locations. "We are delighted to have a movie like this filmed at Paranal and it was extremely good to see how careful the crew were with the surroundings and how mindful they were of the fact that they were in an operating, working observatory", says Tim de Zeeuw, ESO Director General. "Paranal is a unique observatory in a unique setting and it is no real surprise that it plays a major part in a James Bond movie", he adds. The filmmakers were mostly interested in filming exterior scenes at the Paranal Residencia, the accommodation for staff operating the Very Large Telescope. In the movie, the Residencia is supposedly the "Perla de Las Dunas", a unique hotel in the desert. Cerro Paranal is a 2600 m high mountain in the Chilean Atacama Desert, perhaps the driest on Earth. The high altitude site and extreme dryness make excellent conditions for astronomical observations. To make it possible for people to live and work here, a hotel, or Residencia, was built at the base camp. The award-winning design by architects Auer & Weber, which includes an enclosed tropical garden and pool under a futuristic domed roof, gives the Residencia interior a feeling of open space within the protecting walls. Quantum of Solace director Marc Forster was the driving force behind the decision to film in so many unusual areas: "Exotic locations are a trademark of James Bond films, they are crucial in helping transport the audience to a different world. It is hard to find Bond locations because the bar has risen and the world is becoming smaller. We also had to find locations that would reflect the psychological state of Bond. For example, one of the reasons I chose the desert was because it represents solitude and loneliness - it represents Bond's state of mind." Pressed to pick a favourite location, Production Designer Dennis Gassner cites ESO Paranal in the Atacama Desert. "It is the furthest location we travelled to and it came to me in a very serendipitous fashion. We were looking for deserts around the world and the Atacama came up in conversation, so I went online. The first web page on the Atacama had a very, very small photograph of the ESO hotel and it just jumped right out at me. I was here in London, Marc Forster was in Los Angeles at his computer and within five minutes he called and said, 'We have it, this is it!'." The ESO Paranal building gives a nod to the sets associated with the Bond films of the sixties, Gassner comments: "I actually didn't pick the ESO hotel because of the dome, which makes a reference to that great scene in Dr. NO, it just happened to be the situation. I'm glad for it because I love that scene, but it wasn't conscious at all." Most of the scenes inside the Residencia were filmed in the historic Pinewood Studios in Buckinghamshire just outside London. The production used the world famous 007 stage and five other sound stages to build the interiors of over 14 different sets over the six month shoot. The interior of the hotel was built on the 007 stage and fitted with over 50 explosives to film Bond's violent confrontation with his adversary, Greene. It is perhaps fitting that the hotel receptionist in the movie is played by Charlie Chaplin's granddaughter, Oona Chaplin. Her Chilean father is a director of photography.